I went out shopping at the "Villagio" mall yesterday with Rose. As expected, I wasn't able to take that many photos, since we're advised not to get natives into our photographs. I did a little bit of shopping -- H&M had some pretty head scarves that I could wear as non-head scarves (i.e., around my neck). But mostly it was awesome to window shop with Rose, the stores there cover the entire spectrum of shopping experiences, from Claire's jewelry all the way to Chopard! We had a fun lunch at a Mediterreanean lounge, mezzahs and chicken sandwiches. Then we just wandered for the afternoon. For some reason, the juice selection at the dining facilities has been lacking. They have one of those from-concentrate dispenser machines that sometimes works, and the one time I successfully got juice out of it...the juice was brown. Ew? You can buy shelf-stable juice (i.e., not in the refrigerated section) at the BX, but at Carrefour, they had full-fledged dairy, meats, produce, etc. 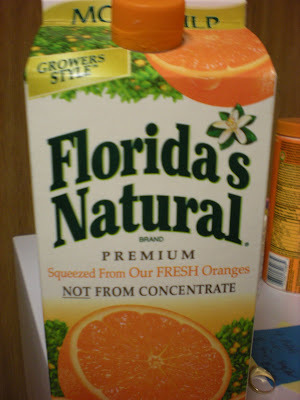 I decided I'd pick up a carton of fresh orange juice. That was harder than I thought. The juices were mostly blends of mango, strawberry, apple, pineapple, lemon and orange juices. They all seemed delicious, but I was on a mission. Jackpot! I was a good girl and only took one carton, though I was tempted to get about 10 of them! 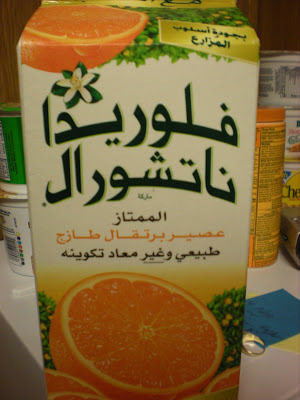 I love orange juice -- especially the super-pulpy stuff. The rest of the family prefers the less-pulp kind (to quote Dave: "I don't want to chew my orange juice"), so I usually enjoy super-thick juices when I'm on my own. Then I noticed the price: 14 Qatari Riyals. That came to about $4.25 for the 1/2 gallon carton! But I don't care -- I have my OJ and today I've enjoyed to nice 8 oz. glasses (okay, plastic cups) of the liquid sunshine! I might be tempted to sneak in one more glass -- er, cup -- of juice before I head to sleep this afternoon.